Preheat an oven to 375. Place the sliced baguette in a single layer on a lined baking sheet. Brush with a little olive oil and bake until golden, about 8-12 minutes. Add the dun dried tomatoes, olive oil, parsley, basil and garlic to a food processor and mix until finely chopped. Season with salt & pepper to taste. If you aren't using it right away, add the pesto to a jar and top with additional oil to cover the pesto. Cover and refrigerate. 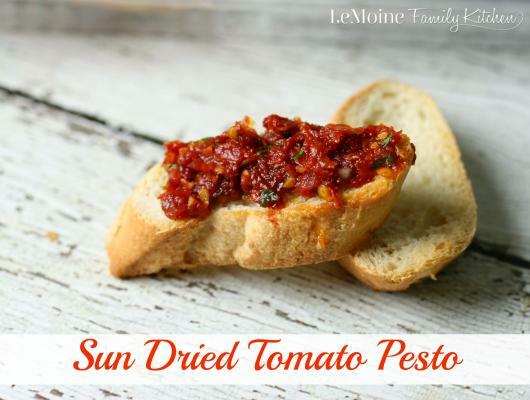 With just 5 ingredients and incredible flavor, you are going to want to make a huge batch of this Sun Dried Tomato Pesto. I love taking simple and bright flavors to make something so versatile like this pesto. I served it this past weekend at our boys birthday bbq and there were a lot of “mmmmm” noises happening! I served the pesto with a simple crostini but it is amazing tossed with pasta and on top of grilled chicken.